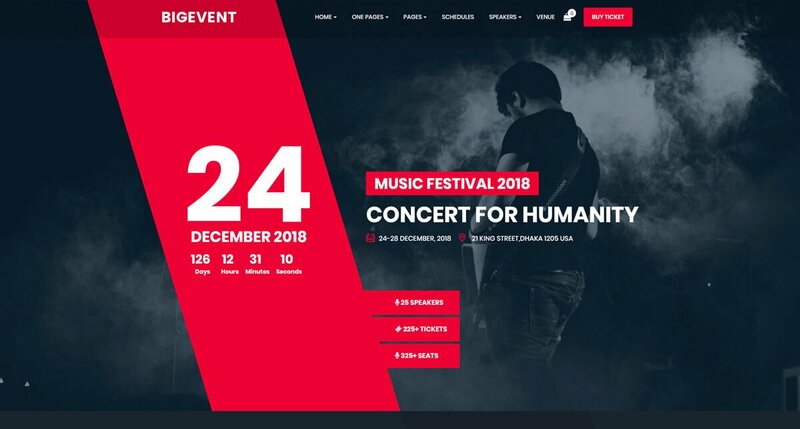 There are so many WordPress themes for event companies but here some awesome and good quality best WordPress theme for event website are listing. Generally, this sites are getting popular among the customer based on good looking and user friendly. Sometimes it very hard to choose the right theme for the events site among the thousands of themes. Therefore, here you can easily find the right theme for your event or conference site among the best themes. One perfect decision makes successful in the business. All of the themes have tons of features, good quality and more professionals. EvenTalk is show up a luxurious design with affordable price among the WordPress themes for event companies. It is fully responsive for conference and event website. You make your event or conference website as you wish, it has multiple different website for meeting your need. EvenTalk has one page and multi home page option. Your event site can easily display in mobile or laptop and also desktop. You can add neoteric schedule event. In addition, your performer of the event can be shown in many style through team showcase. As EvenTalk is newest, it try to get the title of “best WordPress theme for event website” from his clients. For this, it added different header style, more than five-layer slider and make SEO friendly website. You can customize at any time mean live customize option. It helps you to see your event site. “One click demo” installer give you idea about your site. As EvenTalk is only WordPress theme for event management company, so they know the task event company. Because this company one kind of service provider. From that perspective, EvenTalk believe the importance of customer service. They are providing strong customer service regarding this theme. Let see the features of EvenTalk! Eventum is a Presenting theme among the WordPress themes for event companies. These companies are wanted to innovative things for their event. And that things must present in website through which everyone know him. Eventum has that sufficient functionality in their theme. The event companies can do easily exhibition, making conference because of user friendly. You can make your event or conference website according to your requirement. You will get “seven” home page variation. In addition to default layout , video slider, countdown and register at home and so more. 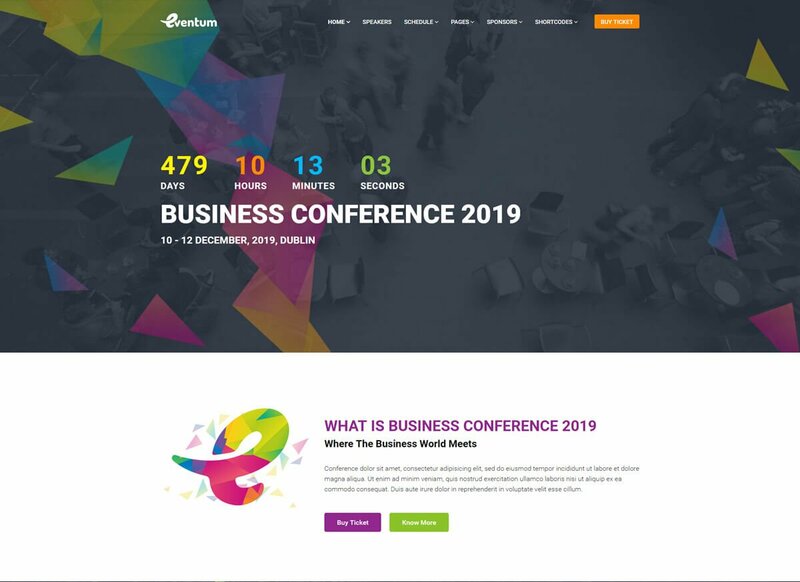 Eventum can be used as a WordPress theme for conference website. It has some more function which will be suit with conference website. As conference website and event website quite same. Eventum has a latest responsive feature and SEO friendly. Let’s see Eventum ! BigEvent is a best WordPress theme for event website who are seeking more customizable option. Someone want to create workshop website, they can choose this theme. Well responsive with gorgeous design. The theme is call perfect because all of the main features like speaker, performer, registration of member etc. are exist here. You can manage the schedule and venue without any hesitating. Easy to use all the function like one click demo installer is ready to show the sample of your website. Neoteric calendar schedule is one of the main features of any WordPress theme for event management company. The things is new but can be used easily. It helps to give good looking any event site. More than five new home page as well as twenty two more than innovative lucrative different Home pages are included here. You can set countdown for your upcoming event. BigEvent give you opportunity to make different style of your Google map. For more details features! 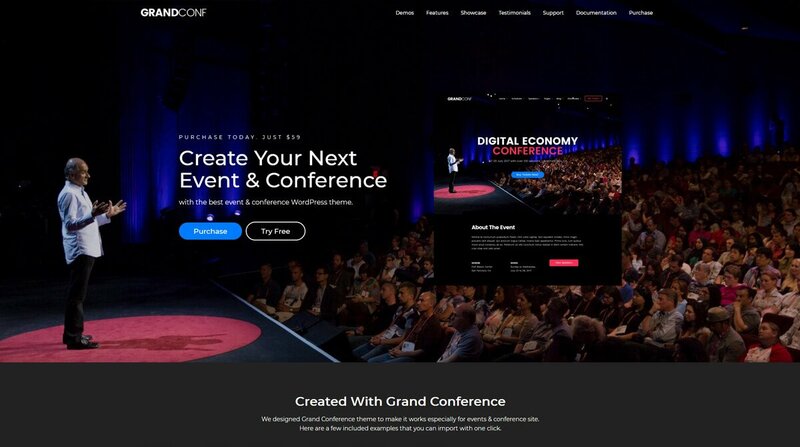 Grand Conference is responsive technologically polished, modern and resourceful WordPress theme for conference website. Someone want to be a different from other , they can use this theme. Here thirty plus pre demo design and this is help for them to make their site different from other. 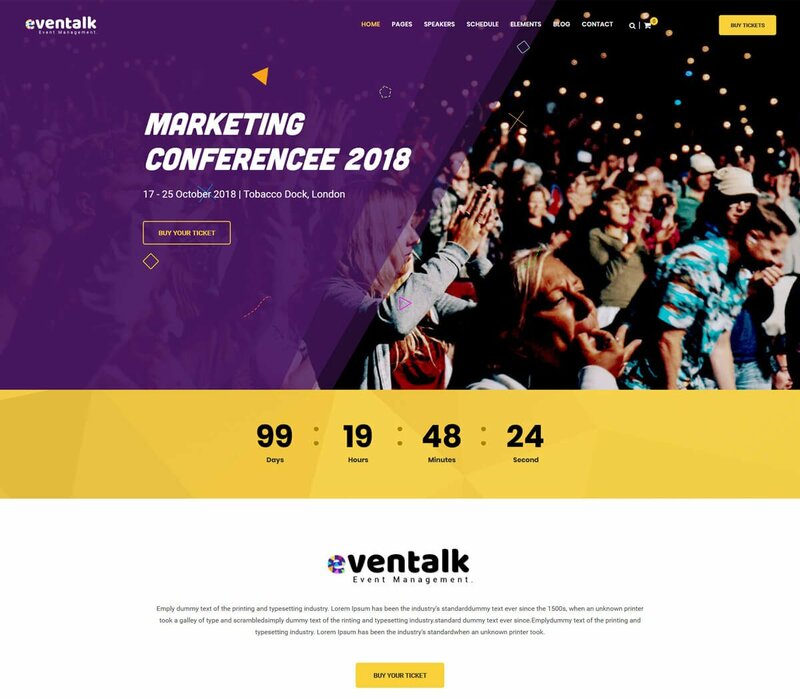 It is not limited for conference, Grand Conference is also made this WordPress theme for event management company. Grand Conference try to give user-friendly website so that user can discover their requirement what are they seeking. Sometimes clients need booking for their site. WooCommerce is used here for doing smoothing booking system. There are ample pre design pages for conference and events. Every page has different ticket table, speakers, schedule etc. Grand Conference is offered multiple various menu layout and so more customizable option. Awesome builder features like live content builder. Unlimited color options along with elegant beautiful background options and so more option are helping to get title “best WordPress theme “! Let’s see! 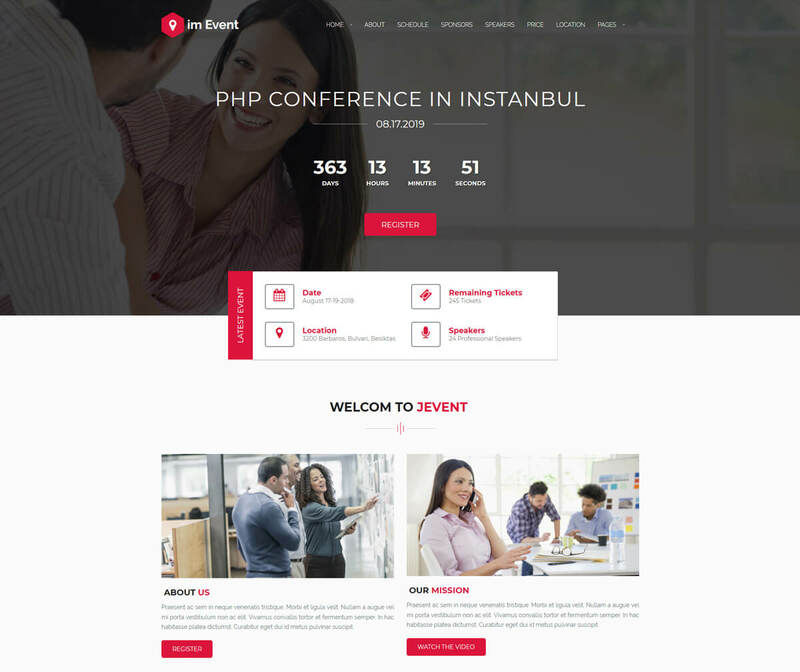 Im Event is a responsive innovative WordPress theme for conference website. It is famous of their design quality and well update with day to day modern demand and also having a good customer service. The volume of sales give you idea how it was! There are is huge numbers of WordPress themes for event companies, but im Event created its own identity by giving tons of features and beautiful functionalities. You use various payment option your event or conference site for registration and also WooCommerce facility is included here. Sometimes it is so important video sliding for the event side. im Event theme has provided that facility. The most amazing thing is that you can add MP3 background music of your event site. To add this feature you don’t need to think about the cost because its free for three variation track. Let’s see the more features of im Event! Eventim is a robust well decorative responsive WordPress theme for event management company. There are few WordPress themes for event companies have opportunity to use festival, conference, meet-up etc. Eventim is one of them which can be used in that sector. As it can be used in different are so that it contains ton of features for meeting all the demand and this a advantage for the clients. Because they can get some more features like extensive panel option , customizable quote calculator and so more. Besides you can easily create a page quick through the page builder. You will get also typography , lots of header and footer layout and menu etc. All of have option to change even though content. Just see the more options of this theme! 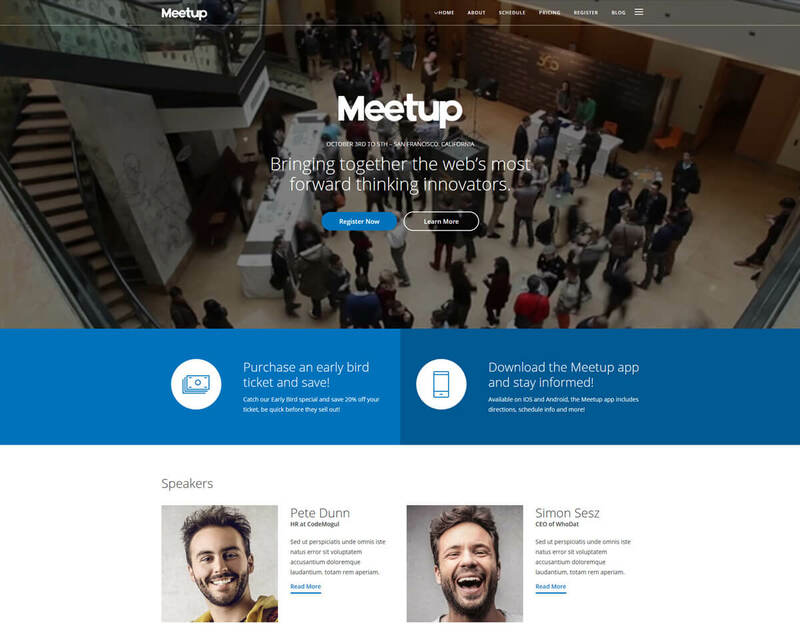 Meetup is a colorful and resourceful responsive WordPress theme for conference website. The theme has many prebuilt demo home page along with lots of features. You may allow to change some features which are customizable. Retina ready display give you the practical awesome experience. Visual composer and built bootstrap and today’s trend Instagram option etc are included in this theme. 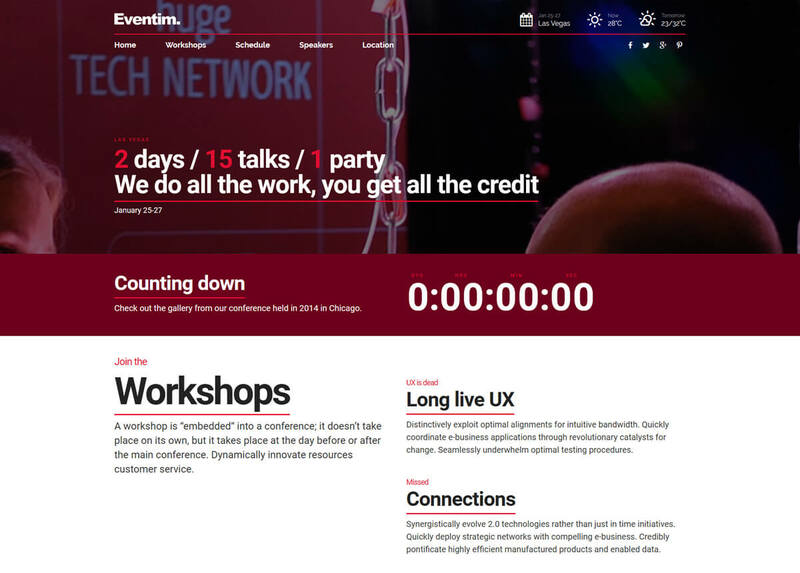 Color schemes and contact form 7 , timer countdown are the attractive features of any event or conference website. You will get two menu location and footer type option. Theme is ready to meetup your demand and having “five star” customer support. Let’s see the features before taking any decision regarding your event ! 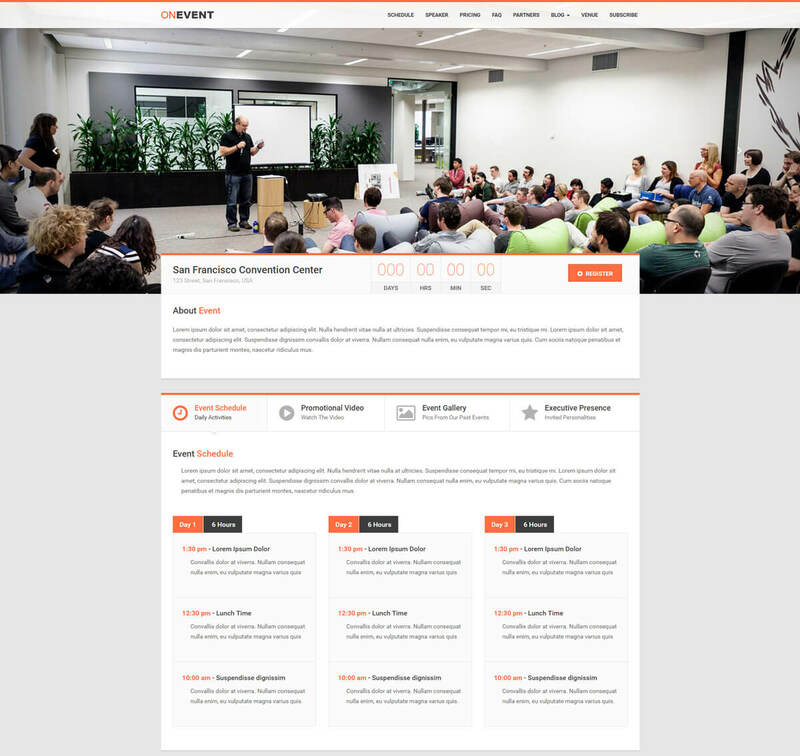 OnEvent is a professional colorful responsive WordPress theme for conference website. It is ready to meet your conference or event site. As OnEvent focus on event related site, so the key features like content presentation, video sliding option get from this theme. In addition, beautiful event schedule, awesome countdown time, rhetorician profile etc are having in the theme. The audience are getting a good experience from this theme. Because OnEvent provide direction option which is Google location maps of your target audience. You can give unique color of your event site because it has limit less color option. Quick customer service is always ready to response your problem. You will get idea to see the review of the customer. Let’s see the OnEvent features ! 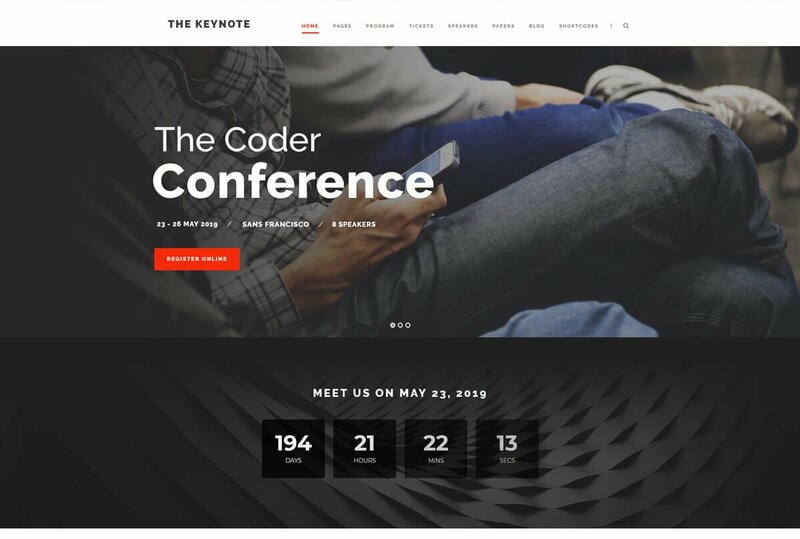 The Keynote is professional attractive well designed responsive best WordPress theme for an event. You can make your homepage more gorgeous for event site by using content slider or can use image. The most prodigious things is that you can also add video in your homepage which is very much important for a conference or event site. It will help to increase your visitors rapidly. Here so many widget are using only for making user friendly. Like you can set timetable, time countdown which is more attractive for audience, upcoming speakers profile and so more things. Even though using Google Map which help your audience to find out you ! The elegant sites have an option to create custom page layout quickly, The Keynote is also has that features by using “page builder”. Let’s see the details features of The Keynote ! 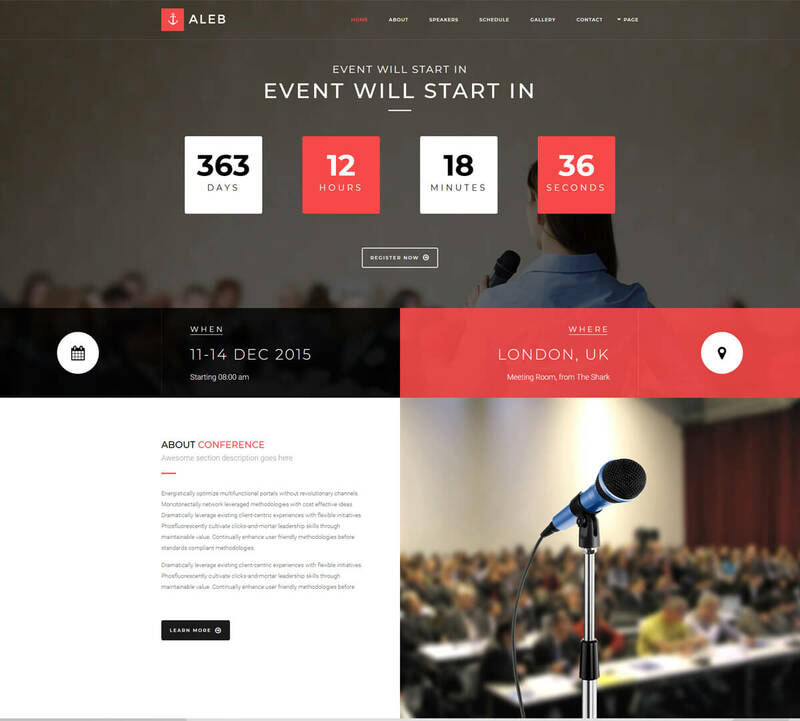 Aleb is a simple eye-catching WordPress theme for event management company but having with ample features. You can easily manage all of things and can arrange the everything your event or conference site. It has visual composer plugin through which can easily create your desire page layout or rectify content as you wish and can experiment your site to see whether it will match with your taste or not. The key features of event of conference that is testimonial, countdown event, gallery, schedule of the event , speakers etc. All this features are existing here. You target audience easily get the idea why they have to come in this website. Let’s see Aleb!